Living Green SupremeFood by Divine Health makes me feel "healthy" and gives me energy. Tastes really good! A truly unique experience. 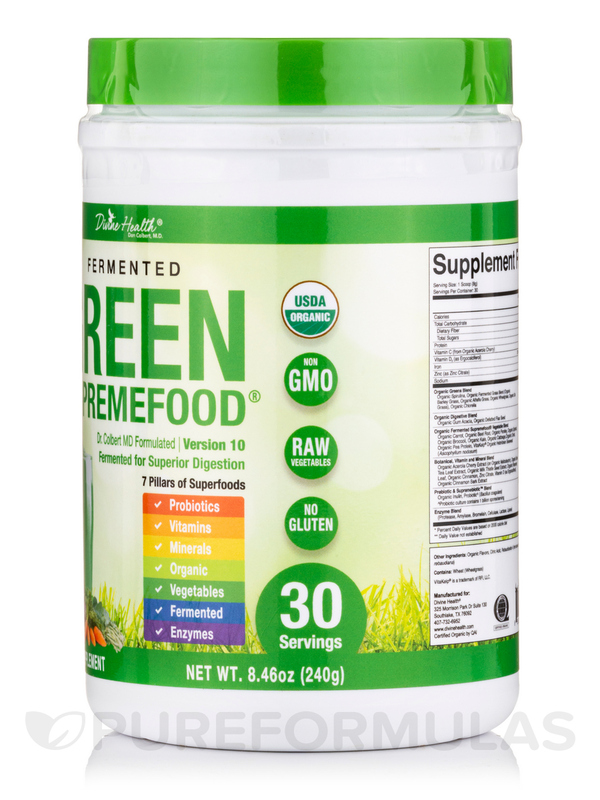 The ingredients in Fermented Green Supreme Food by Divine Health provide essential nutrients we all need and it tastes great, even in plain water. I love Fermented Green SuprremeFood by Divine Health! It gives me a lot of energy and it tastes great. A product has to taste good or you will not use it. There are 10 organic greens in it so I know I'm getting what my body needs. Fermented foods have been a food choice for centuries. The practice is defined as a transformation of a substance (organic food) caused by bacteria‚ yeasts‚ molds‚ and other microorganisms. Complex organic catalysts and enzymes trigger a chemical response in the organic substance(s). In early history‚ this transformation was considered an act of the Divine. Since the practice occurred in the Jiahu village in China‚ where honey‚ rice‚ and beverages were made via fermentation. Researchers suggest that the process of fermentation was most likely stumbled upon when people started using salt in food. The accidental discovery of salt’s preservative power later led to the ancient Chinese to begin inoculating foods with enzyme creating molds. In more modern times‚ the fermentation process is also used to make vitamins‚ antibiotics‚ and both gluconic and citric acid‚ in addition to its continued use on the preservation and transformation of foods and beverages. Green tea leaf extract‚ milk thistle seed extract‚ rosemary leaf‚ cinnamon‚ licorice root‚ cinnamon bark extract. Protease‚ amylase‚ bromelain‚ cellulase‚ lactase‚ lipase. Other Ingredients: Organic flavors‚ citric acid‚ rebaudioside A (from leaves of organic stevia rebaudiana). USDA Organic / Dairy-Free / Non-GMO Ingredients / Gluten-Free / Soy-Free / Rice-Free. Mix one serving‚ (1 scoop) in a 4-8 oz. container of your favorite juice or water. Stir briskly or shake until the desired consistency is achieved. Best taken 30 minutes after eating. If inner seal is broken‚ do not use. 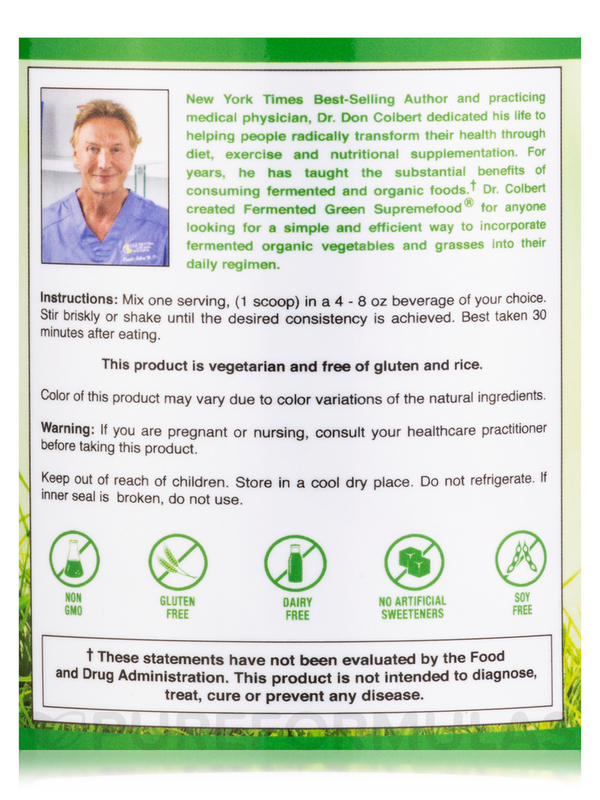 Allergen Caution: Contains Wheat (Wheatgrass). We love Fermented Green SupremeFood by Divine Health! The taste is better than other green nutritional drink mixes I have tried. My hubby isn't too crazy about the taste, but does say he finds it tolerable. You have to mix this a whole lot in order to get it better blended, though even with extra mixing, there are always a lot of left over particles (nutritional stuff), once you drink the first cup. So I just add a little more water to the mug after I drink the first amount, and mix those particles in again, to get all of the nutrition I am supposed to get out of that scoop of mix. We feel better, and more energetic, after taking this mix regularly. It is great to know our bodies are getting great supplementary nutrition! Look at the label: you'll find a ton of good stuff in there that you can't usually get in all of those categories, within one nutritional drink mix! Love, love, love! Though I do believe there are the promised 30 servings in the container, the container itself is misleading, because it is only less than half full when you open it new. However, I'm fine with that (as long as everyone knows that is the case when they order it), as I believe the company is trying to leave adequate height for the included scoop handle to fit into the container correctly...and, this IS a powder formula, so the extra space does give the powder a chance to settle down inside the container, once you scoop the mix to use it. So, overall, the size of the container doesn't bother me, as it's still small enough to fit on most shelves. So many unusual categories of nutrients in only one drink mix! Taste is good for this kind of thing. The mix doesn't blend too well, even when I always mix it thoroughly. However, if I'm drinking grass pieces, I don't expect to get those to ever blend in totally! So I'm fine with that, since that means it isn't processed (which I like, and wish more "healthy"-categorized items were not so processes at times! Less processed is better for our digestive health! 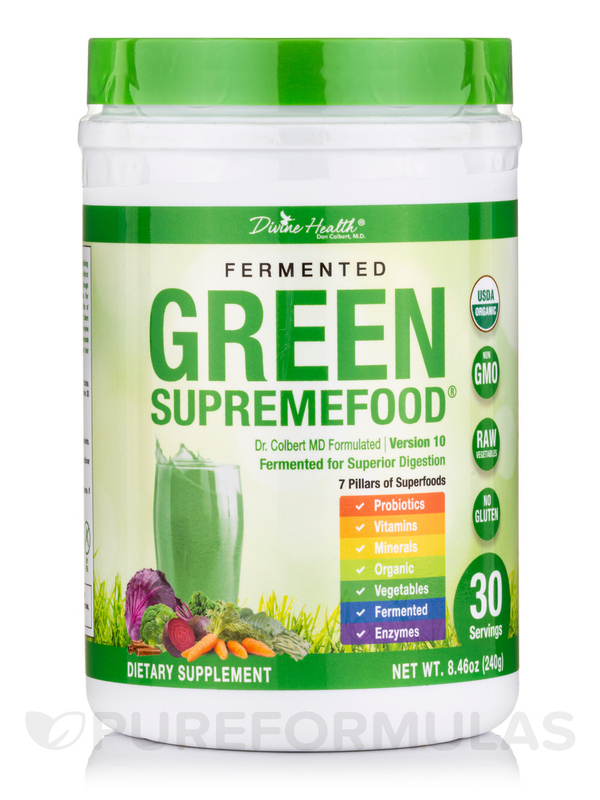 I have used Fermented Green Supreme Food by Divine Health for several months (on and off). 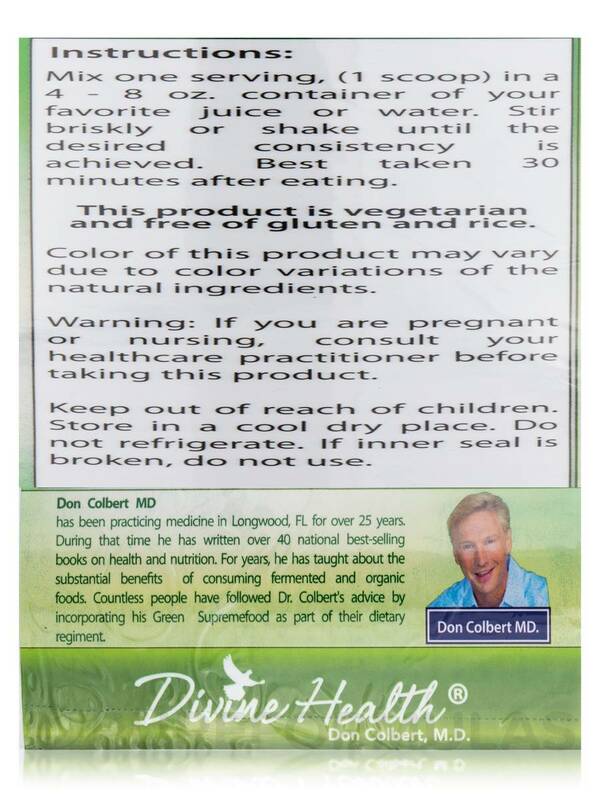 I originally purchased this product after using a product to cleanse the intestines. 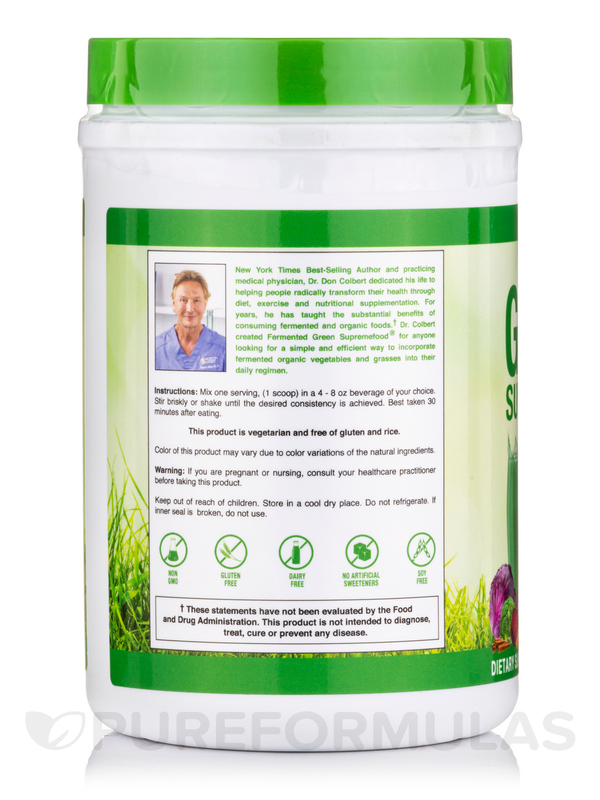 Green Supreme Food has ingredients to refurbish the good bacteria in your digestive system critical to digestion of food. Green Supreme Food has a great taste. It also provides a supplement of vegetables for those times when I don't eat all that I should. I seem to have less digestive track issues when using Green Supreme Food. I learned about Green Supreme Food while researching potential supplements on the internet. 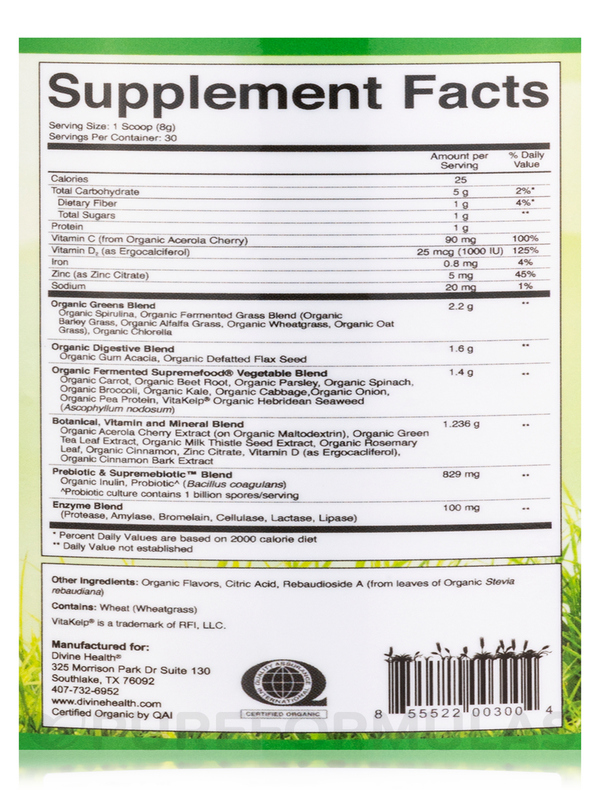 I found a sight that compared different supplements and Green Supreme Food was the best rated for its variety of ingredients and price per serving. I would recommend this product to those who don't eat enough vegetables and who are experiencing digestive track issues. Good taste. Quick preparation. Helps in digestion and keeping me regular. The scoop handle is too long making it difficult to close container when container is more than half full. Increased energy and great taste. The price but this is the cheapest I have found. I hope you get more in stock. Great taste! It's Organic. It is wonderful to find a Superfood that delivers the benefit of having all these ingredients in a soluble concentrated powder. I have bought the ultimate meal before and the cost at the time was $59.95 for 1200gram. I received this huge container that is supposed to be full of a ton of organic ingredients,(taste not good, but manageable mix with juice in a blender) the company got me with the marketing, but still haven't seen a USDA stamp on the can, but you can't beat the price for what you get. I was getting a bargain before I tried living green, definitely a huge difference and looks and smell. You get much less with living green, which makes believe that the ultimate meal be full of fillers after all or is definitely an inferior product compare to living green. Once I open it and saw how green it was and the sweet smelling aroma and tasted it, I was like wow. this is truly the first green product that I smell and taste was actually that taste pretty good, but I don't taste any chances I mix everything with juice, banana and a blender. This so far seem to be worth the money. I drink a lot of coffee, and have a high sugar diet, I am working on quitting, so this drink is suppose to replace my coffee habit. the first day using Living Green SupremeFood by Divine Health, 1 scoop mixed with mango juice, an epic poop. I must have got rid waste I didn't know I had inside me for a week, 2nd and 3rd day nothing like the 1st day, just regular bowel movements, but I did realize that I was starting to feel better, not feeling rundown, like I usually do. But it has only been 3 days, so haven't been on the product to give an in-depth review, but so far I will reorder Living Green SupremeFood. I feel that by the end of the 30 days I will definitely in better health than I started, because this product does lower your cravings for junk food, but I have still been drinking coffee with almond milk to dilute the coffee contents. Vibrant green color and sweet smelling aroma, and the taste. The price is somewhat expensive for the size, but compare to other green foods, this price was actually cheaper than most high quality green powders, especially for the rating and ranking. Though I have just begun using Living Green SupremeFood by Divine Health, I am expecting an excellent outcome. I researched the best "greens" products on the market, and Living Green Supreme was one of the highest ranked products. The high ranking was due to the quality of the product ingredients. 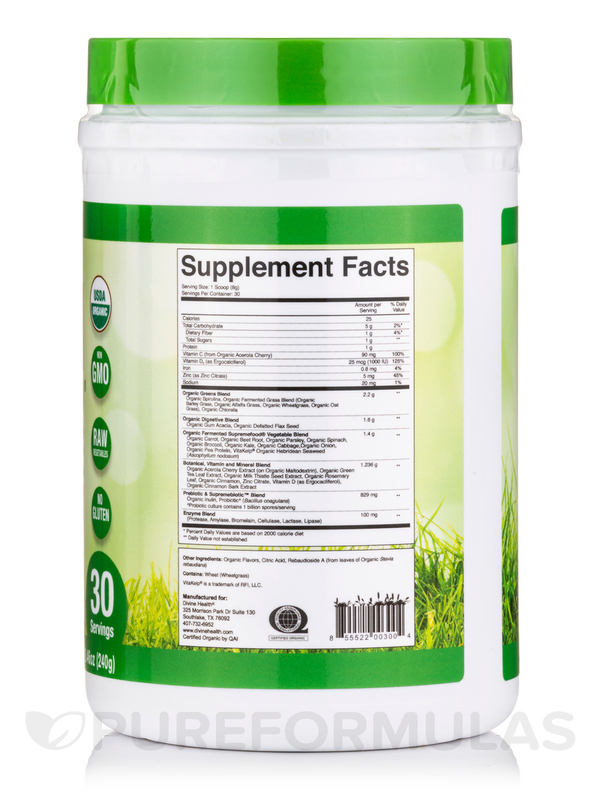 It contains 16 organic Super Foods in the form of algae, grasses , fruits, and veggies. Of importance is that the grasses are organic and fermented. High quality and pleasant taste. Tastes great. Easy to prepare. Cost over $1.00 per serving. This has been my third month using this green drink. It is easy to fix and the taste is easy to handle. My energy level has increased and I seem to feel better all the way around. I feel like I am doing my body a favor especially since I could not get all of this nourishment from food alone. If you are on the fence this is a good one. Living Green SupremeFood is very healthy. I use it every morning with my breakfast. Would like to order Fermented Green Supreme Food but it is out of stock...Can I still get the discount when back in stock ? Hello Margaret,Thank you for choosing PureFormulas.com!I do apologize but offers are while supplies last and each discount has an expiration date.The Superfood discount doesn't end until 08/31/2016.Hope you have a happy and healthy day.